In January 1968, The Times published an “Appeal to World Public Opinion” from two Soviet citizens, Pavel Litvinov and Larisa Bogoraz, asking intellectuals everywhere to condemn the rigged trial of two dissidents and help forestall the expected heavy sentences. The word “dissident” was still new then and only just coming into vogue, and in fact this was Litvinov and Bogoraz’s first “dissident” act of their own. Unfortunately it didn’t help. Their two friends, Alexander Ginzburg and Yuri Galanskov, were sentenced to seven years in the labour camps for doing just the kind of thing that Stephen believed in — publishing a magazine — and Litvinov and Bogoraz went on to demonstrate publicly in August 1968 against the crushing of the Prague Spring (and earn sentences of their own). Stephen had no idea, of course, of this later turn of events, when he and Natasha felt moved to organise a telegram of support in answer to Bogoraz and Litvinov’s appeal. Having obtained the signatures of WH Auden, AJ Ayer, Cecil Day-Lewis, Stuart Hampshire, Julian Huxley, Mary McCarthy, Henry Moore, J B Priestley and Bertrand Russell, among others, they expressed a readiness to help “by any means open to us” and sent it to Litvinov. The text of the telegram was also broadcast by the BBC Russian Service, and as I have said, didn’t help the unfortunate Ginzburg and Galanskov, especially the latter, who died in the labour camps. The publicity did seem to help Litvinov and Bogoraz, however, who were sent into Siberian exile rather than imprisoned and, eight months later, Litvinov unexpectedly responded. Citing the telegram’s offer of help, Litvinov wrote that he and his fellow human rights activists would like to think of it not as a “rhetorical phrase” but as a genuine offer of assistance. He went on to ask for the creation of an “international committee” of “progressive writers, scholars, artists and public personalities” to support the “democratic movement in the USSR,” and added: “Of course this committee should not have an anti-communist or anti-Soviet character. It would even be good if it contained people persecuted in their own countries for pro-communist or independent views.” The important point was to oppose violence in the pursuit or defense of any particular ideology, and not solely communist ideology. Litvinov’s letter was a sort of challenge to Stephen and his co-signatories: put your money where your mouth is, and Stephen was energised enough to disregard his earlier Encounter disappointment and throw himself again into a new cause. [ Spender was the English literary editor of Encounter. In 1966 its reputation was tarnished (along with the reputation of its editors), when it was revealed that it had been funded from its very beginning by the Central Intelligence Agency] Together with Stuart Hampshire he approached David Astor, the crusading editor of the Observer, for financial support, and Astor, who had distanced himself from Stephen’s “son-of-Encounter” endeavour, this time willingly agreed. Together they rounded up another impressive group of intellectuals for the board, including Louis Blom-Cooper, Edward Crankshaw, Lord Gardiner, Elizabeth Longford and Sir Roland Penrose, with Dame Peggy Ashcroft, Sir Peter Medawar, Henry Moore, Iris Murdoch, Sir Michael Tippett and Angus Wilson as patrons. They formed an organisation called Writers and Scholars International (WSI), which not only echoed the name of the still new Amnesty International, but was envisaged as a sort of sister body, or even a subdivision of Amnesty. Litvinov had proposed two possible forms of action. One was to launch protests and appeals defending individuals against persecution for their beliefs and writings, the other was to inform world public opinion about them and publish some of their censored texts. Given our limited funds, as newly appointed director I decided to let Amnesty take care of the protests and appeals and to see if we could manage the second option. In taking this course I had a goal of my own, namely to fulfill a secret desire to edit a literary publication of my own (the only thing I had edited before that was the student newspaper at Nottingham University — though it did win a national prize), and since I had read about Stephen’s travails with the CIA and his attempt to start a new journal, I thought he might look kindly on a similar, if much less ambitious, venture along similar lines. Moreover, though I hadn’t known Stephen at the time of the Encounter affair, I fully sympathised with his sense of betrayal (for Encounter had been a highly liberal journal in most of its editorial policies, despite its sources of income), and I had hopes of starting what I thought of as a “counter-Encounter”, one with a narrower and purer mandate, namely to oppose and combat censorship by all peaceful means possible, without the encumbrance of any sort of government backing. I proposed to the WSI board that we start a modest newspaper or journal of our own, and after a brief discussion I was given the go-ahead. I’m bound to say that this circumstance undercuts the idea that Stephen was the begetter of Index, for the original idea was mine, as was the name, but of course it was Stephen who had set in motion the entire process leading to its establishment, and his enthusiastic endorsement and support were crucial to whatever success it enjoyed. He and I saw absolutely eye to eye on the nature of our mission. We still felt that the US and its allies, including Britain, were fundamentally correct in their opposition to Soviet expansionism and Soviet ideology, and we endorsed the principle of a cold (as opposed to hot) war of ideas to further that aim. At the same time, we regarded other aspects of American and British foreign policy as short-sighted and counter-productive, namely the tendency to go easy on, or even support, authoritarian right-wing regimes such as those run by Franco in Spain, Salazar in Portugal, or the Shah of Iran, simply because these regimes were anti-communist. Encounter’s sin had consisted not in supporting those regimes, but rather in remaining silent about them, and we were determined not to undercut our moral authority by sacrificing our core values. In this we felt we were in complete harmony with Litvinov’s recommendations, convinced that an impartial hostility to censorship wherever we found it (including, on occasion, England and America) would carry more weight everywhere, even in the Soviet Union, than would a selective, one-sided approach. It required a positive act of will to imagine what it was like for writers and others to live under tyranny, to have their words suppressed and be persecuted for even expressing them, and it was one of Stephen’s gifts, with the empathy of a true poet, not only to be able to imagine them but also to act on his insights and attempt to alleviate them. His informed concern for suffering fellow writers (and through them for suffering individuals everywhere) is a fitting reminder of his deep and abiding humanity, and the founding of Index on Censorship was a small token of that. 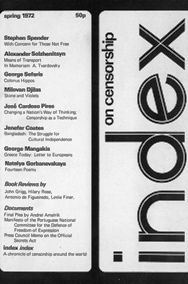 Michael Scammell edited Index on Censorship from 1972-80. His biography of Arthur Koestler, Koestler: the Indispensable Intellectual, is published by Faber & Faber.